For many people in today’s society cursive writing is unreadable! According to the Merriam-Webster dictionary, Cursive means ‘flowing often with the strokes of successive characters joined and the angles rounded,’ while Conundrum ‘an intricate and difficult problem.’ What is all the fuss about cursive writing you ask? Cursive writing has been taught in schools for hundreds of years, but with the advent of technology such as typewriters, word processors, personal computers and texting, schools began to eliminate cursive writing from the curriculum. The result is that today, not only can some people not write, but they also cannot read cursive writing. 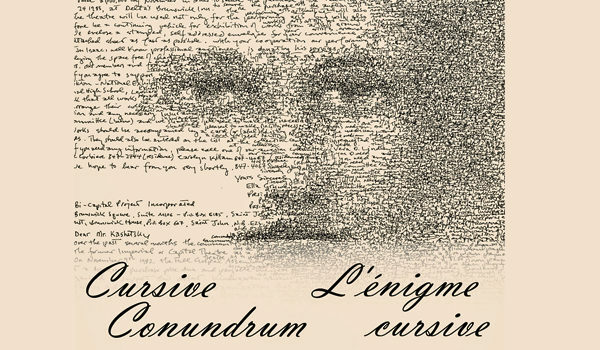 The Cursive Conundrum exhibition, through a wide array of examples, will explore the history of cursive writing, how it was taught, the artistic aspects, what it reveals about a person, and why this dying skill continues to be important. “This is a wonderful opportunity to raise awareness of archives and their functions while also underlining the importance of being able to read historical documents which link the past, present and future,” says Felicity Osepchook, Curator of Archives & Manager Research Library. Visitors can see a variety of archival holdings and artifacts from the New Brunswick Museum collections, including the Frankland Journal that just arrived back in time for the exhibition, after extensive conservation work by the Canadian Conservation Institute (CCI). Take a seat at an old school desk and share with your children and grandchildren (or your loved ones) how to write your name and watch them learn to do the same. Take some time and be inspired to write a letter to a friend – beautiful cards and postcards available at the Museum Shop and drop it in the mail (aka snail mail!). The NBM has received on loan a used mailbox to complement this exhibition. The mailbox will be used for visitor comments. Postcards will be available to visitors for handwritten comments and can be “mailed” in the box. “The exhibition gives a great opportunity to see how much we are still using handwriting daily, at work, at home and to realize that our children won’t have the capacity to do it…even to sign their name properly. All the questions about falsification pop into my head…are we losing our individuality with the use of computers? I love Cursive Conundrum because it asks a real question of our time – the incapacity to read cursive is not just a question for institutional archives, it’s also about our personal heritage, our own family history,” says Dominique Gélinas, Head of Exhibitions and Visitor Experience. The exhibition will continue at the NBM until May 26, 2019. Visit our website and social media channels often for updates and information on future activities and programs that will take place during the time this exhibition is here at the NBM! We’ll be asking you to share on social media some of your favorite cursive writing as well! The NBM wishes to thank its partners and sponsors of this exhibition including: New Brunswick Society of Retired Teachers – Saint John Branch, and Sisters of Charity of the Immaculate Conception.